On March 17th every year, Irish compatriots from across the world join together for St Patrick’s day celebrations, one of the most important dates in the Irish calendar. Traditionally the day was a commemoration of Saint Patrick, he is the patron saint of Ireland and is associated with the arrival of Christianity in Ireland. Today the St Patrick’s day holiday is a celebration of all things Irish from shamrocks and Guinness to leprechauns and Gaelic football. In 2019, St Patricks Day falls on a Sunday making it even easier to celebrate as there is no need to book time off work! Why is St Patrick’s day celebrated? St Patrick grew up in Ireland after being captured by raiders at only 16 years of age and was kept as a slave. According to popular legend he famously rid Ireland of snakes, however, the truth behind this legend is shrouded in mystery as it’s believed that no snakes have been indigenous to Ireland since the last ice age. One theory is that the snakes being referred to in the story were actually druids or pagan worshipers that worshipped snake like gods. It is not known what year St Patrick actually died but we do know it was on the 17th March, the day on which we now celebrate St Patrick’s day. Gold has a long association with Irish folklore. Gold is often seen as a symbol of good luck and a popular Irish myth tells the tale of leprechauns love for gold! Leprechauns are often associated with wealth due to their love of gold coins, they know when they are onto a good thing! Leprechauns as the mischievous creatures they are scour the earth for gold and when they find it, they store it in a pot of gold at the end of a rainbow. Whether you believe in this tale or not, it’s fun to indulge in the leprechauns love for gold on St Patricks Day. There are many symbols which relate to St Patricks Day, but one of them are gold coins. Other symbols include leprechauns, beer jugs, clover, hats, the Irish flag and much more! St Patricks Day wouldn’t be the same without some gold coins! If you’re looking for a special present to give to a loved one this St Patrick’s day, then gold represents the perfect gift idea. A gold coin or a small gold bar is a beautiful and unique gift that demonstrates just how much that special person in your life means to you. You can guarantee that not many people will be getting gold this St Patrick’s day, so your present will mean that much more. Gold coins or gold wafer are often given as special gifts to a loved one. Normally when they are celebrating a momentous occasion such as their 18th/21st birthday or as a wedding gift. Gold represents a great gift idea for several reasons. 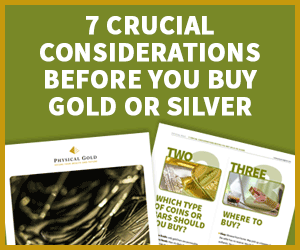 Not only is it an excellent store of wealth that has been proven to hold its value over long periods of time, but it also introduces your loved ones to the idea of saving/investing and the many benefits of collecting gold. Unlike money which just tends to be spent straight away, gold is a long-lasting gift that can be treasured over time. Whether it’s a small gold bar or a shiny gold sovereign, gold is the gift that keeps on giving. Physical Gold, stock a large range of gold collector’s coins perfect for gift giving this St Patrick’s day. From gold sovereigns to Gold Lunar Dogs, we have a gold coin for every occasion. Call us today on 020 7060 9992 or browse our complete range of collectable gold coins here. This entry was posted in Blog and tagged gold gift.